Artist depiction of an asteroid on a collision course with Earth. This article was originally published at The Conversation. The publication contributed the article to Space.com's Expert Voices: Op-Ed & Insights. Around sunrise on Feb. 15, 2013, an extremely bright and otherworldly object was seen streaking through the skies over Russia before it exploded about 97,000 feet above the Earth's surface. The resulting blast damaged thousands of buildings and injured almost 1,500 people in Chelyabinsk and the surrounding areas. While this sounds like the first scene of a science fiction movie, this invader wasn't an alien spaceship attacking humanity, but a 20-meter-wide asteroid that had collided with the Earth. What is worrisome is that no one had any idea this 20-meter asteroid existed until it entered the Earth's atmosphere that morning. As an astronomer, I study objects in the sky that change in brightness over short time scales – observations that I use to detect planets around other stars. A large part of my research is understanding how we can better design and run telescopes to monitor an ever-changing sky. That's important because the same telescopes I'm using to explore other star systems are also being designed to help my colleagues discover objects in our own solar system, like asteroids on a collision course with with Earth. A meteor is any chunk of matter that enters the Earth's atmosphere. Before the Chelyabinsk meteor met its demise on Earth, it was orbiting our sun as an asteroid. These rocky objects are normally thought to be restricted to the asteroid belt between Mars and Jupiter. However, there are many asteroids throughout the solar system. Some, like the Chelyabinsk meteor, are known as near-Earth objects (NEOs). The Chelyabinsk meteor likely came from a group of NEOs called Apollo asteroids, named after the asteroid 1862 Apollo. There are more than 1,600 known Apollo asteroids logged in the JPL Small-Body Database that have orbits that may cross the Earth's path, and are large enough (over 140 meters), that they're considered potentially hazardous asteroids (PHAs) because a collision with Earth would devastate the region hit. The scars of these past collisions are prominent on the moon, but the Earth also bears the marks of such impacts. Chicxulub crater on Mexico's Yucatan Peninsula was created by the Chicxulub asteroid that drove the dinosaurs to extinction. The Barringer Crater in Arizona is just 50,000 years old. The question is not if a dangerously large asteroid will collide with the Earth, but when? The U.S. government is taking the threat of an asteroid collision seriously. In Section 321 of the NASA Authorization Act of 2005, Congress required NASA develop a program to search for NEOs. NASA was assigned the task of identifying 90 percent of all NEOs greater than 140 meters in diameter. Currently, they estimate that three-quarters of the 25,000 PHAs have yet to be found. To reach this goal, an international team of of hundreds of scientists, including myself, is completing construction of the Large Synoptic Survey Telescope (LSST) in Chile, which will be an essential tool for alerting us of PHAs. Exterior view of the Large Synoptic Survey Telescope, which is still under construction. Sublocation Cerro Pachón, Chile. With significant funding from the U.S. National Science Foundation, LSST will search for PHAs during its 10-year mission by observing the same area of sky at hourly intervals searching for objects that have changed position. Anything that moves in just one hour has to be so close that it is within our solar system. Teams led by researchers at the University of Washington and JPL have both produced simulations showing that LSST on its own will be capable of finding around 65 percent of PHAs. If we combine LSST data with other astronomical surveys like Pan-STARRS and the Catalina Sky Survey, we think we can help reach that goal of discovering 90 percent of potentially hazardous asteroids. A photograph and a baseline design rendering mix, showing a view of the completed exterior building from the road leading up to the site. Both the Earth and these asteroids are orbiting the sun, just on different paths. The more observations taken of a given asteroid, the more precisely its orbit can be mapped and predicted. The biggest priority, then, is finding asteroids that may collide with the Earth in the future. If an asteroid is on a collision course hours or days before it occurs, the Earth won't have many options. It's like a car suddenly pulling out in front of you. There is little that you can do. 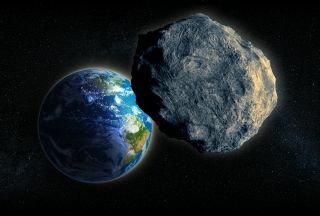 If, however, we find these asteroids years or decades before a potential collision, then we may be able to use spacecraft to nudge the asteroid enough to change its path so that it and the Earth don't collide. This is, however, easier said than done, and currently, no one really knows how well an asteroid can be redirected. There have been several proposals for missions by NASA and the European Space Agency to do this, but so far, they have not passed early stages of mission development. The B612 Foundation, a private nonprofit group, is also trying to privately raise money for a mission to redirect an asteroid, and they may be the first to attempt this if the government space programs don't. Pushing an asteroid sounds like an odd thing to do, but when we one day find an asteroid on a collision course with Earth, it may well be that knowledge that will save humanity. This article was originally published on The Conversation. Read the original article. Follow all of the Expert Voices issues and debates — and become part of the discussion — on Facebook, Twitter and Google +. The views expressed are those of the author and do not necessarily reflect the views of the publisher. This version of the article was originally published on Space.com.